Image Credit: Wally Mandarrk, Ngalkit (Saratoga-Scleropages jardini), Bokorn (spangled grunter) and Bikurr (Nailfish-Neosilurusater), n.d, natural earth pigments on eucalyptus bark. The Cbus Collection of Australian Art. Indigenous artist Wally Mandarrk (c.1915-1987), a senior member of the Barabba clan from Arnhem Land, was a man of significant status who had undergone initiation rituals and ceremonies, and was believed to possess special powers known as mankordang. These powers were said to allow Mandarrk to travel distances at an unnaturally fast pace and conduct sorcery. He was revered for his relationship with the Mimih spirits that populated the area, which are prevalent in Aboriginal spirituality. Mimih spirits which are seen to pervade bush food, animals and plants, form the major part of Mandarrk’s subject matter. They are painted with thick, white paint made from natural materials. Mandarrk was one of the last artists of the Arnhem Land area to engage in rock painting, and as such, his bark paintings have a strong correlation to this practice in both the materials used and subjects depicted. 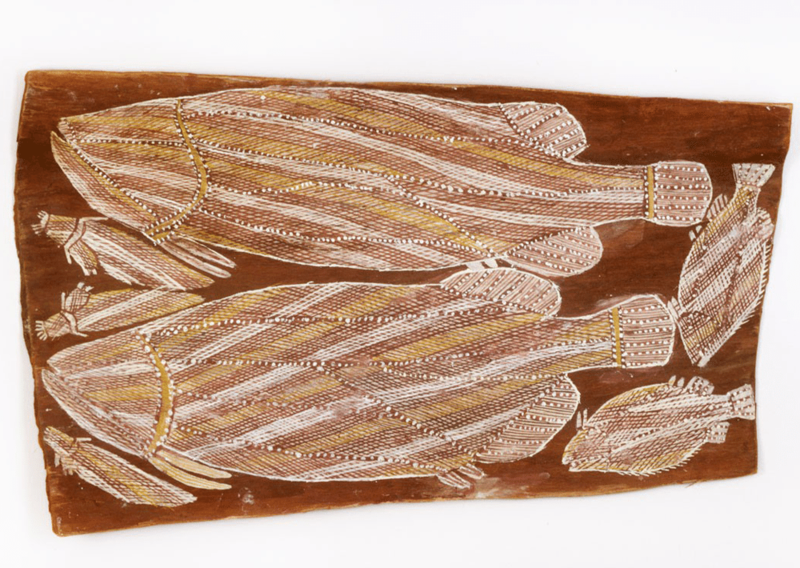 Mandarrk’s bark paintings are represented in the collections of the National Gallery Of Victoria and the Art Gallery of New South Wales. His works has been included in numerous exhibitions including Crossing Country: The Alchemy of Western Arnhem Land Art, Art Gallery of New South Wales (2004) and Men of High Degree, National Gallery of Victoria (1997).